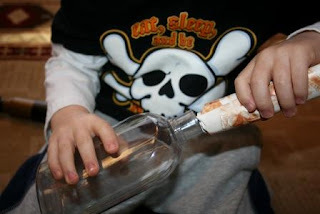 Two Bears Farm and the Three Cubs: ARGsessed with Pirates! My brother, Taylor, got this pirate ship for Pierce as an early gift. I think Pierce was one? 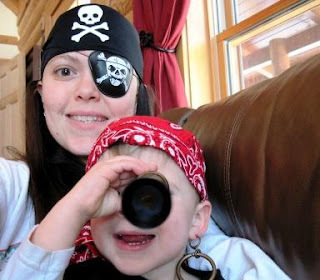 We are serious about starting our pirate training early. 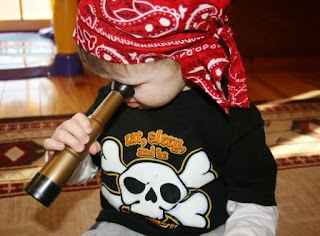 I confess that Pierce has no fewer than FOUR pirate themed shirts. This, when all he ever wants to wear is pjs. <-----------Please note that Elmo is part pirate too. 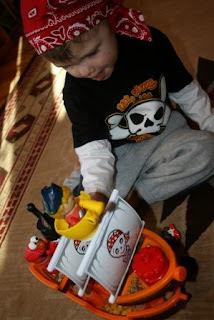 I confess that I had pirate goodies stashed away for a rainy snowy day. The Pirate Adventure book I got for $2.00 on Barnes and Noble's 75% off clearance! 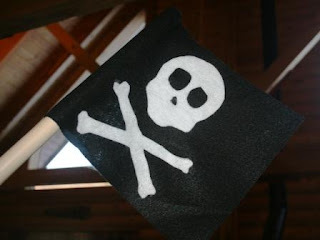 We used some black and white felt to make our own pirate flag. I hope Paul didn't actually need this PVC I found in the basement for something else. 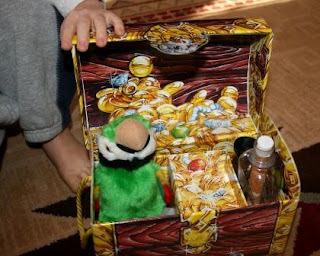 No kid would really be a pirate without a treasure chest full of booty. This is a hand-me-down from my brother, John. Testing out the spy glass. 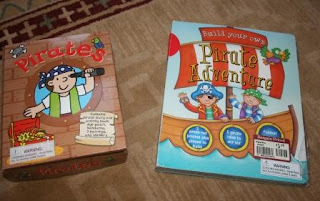 We built our pirate adventure (cute book!) 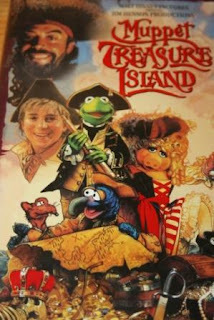 and watched Muppet Treasure Island (which Pierce couldn't really get into...I guess he's a little young still). Reid worked on his mad pirate skills. 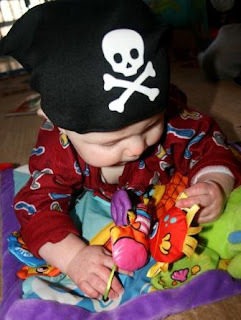 Yes, even the twins have a little pirate playmat. They love it. It makes crunchy noises when you play with the people and fish. And the alligator is a puppet. Ahoy! Scooter did his best to find his sea legs. All four of them. And we made our own pirate map. We drew on a piece of white construction paper and colored it in. 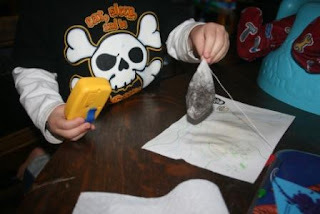 Then we wet a tea bag and rubbed it over the surface to make it look old. After that we roughed it up a bit. Aaargh! You be a-makin' the family so proud me-Lisa. I love all his pirate things! 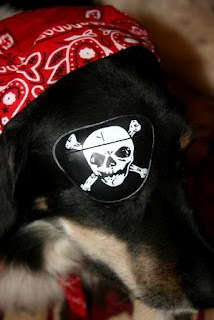 We love pirates as well..